Hixon-based firm sponsors the UK’s longest team endurance challenge! 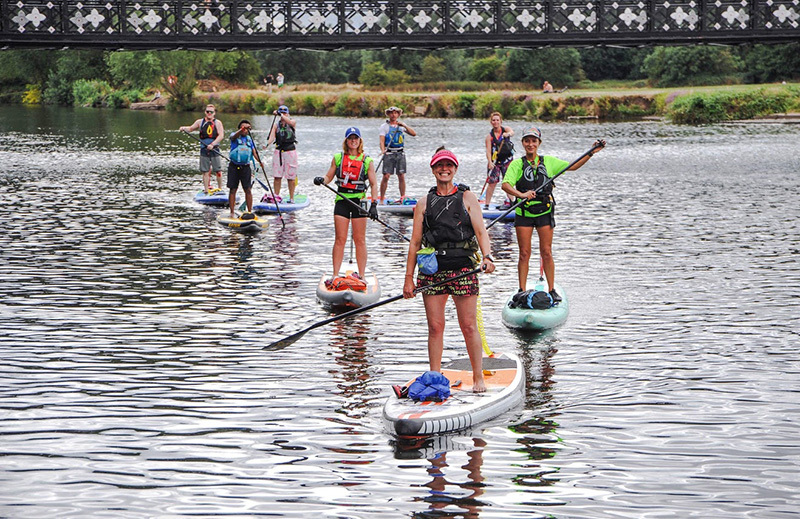 Now in its third year, the Trent 100 is the UK’s longest team endurance challenge for stand-up paddle boarders. This year’s two-day event took place from Friday 3rd to Saturday 4th August, starting in Shugborough Hall and finishing in Nottingham at the Nottingham Riverside Festival of World Music and Arts. A spokesperson for Trent 100 said: “We were very grateful to be supported again by Inta and Zilmet, which has helped us grow into a globally appealing adventure sport challenge that attracts athletes from around the world. This year we saw more than 100 challengers test their fitness and teamwork in the beautiful English countryside.” Teams taking part paddled along the River Trent for the two days, covering 100km of fast water before crossing the finish line. Headquartered in Hixon, Inta is one of the UK’s leading bathroom, plumbing and heating manufacturers and has been developing and producing products for more than 15 years. Meanwhile Zilmet, a group company, is an internationally-renowned - and Europe’s largest - expansion vessel and heat plate exchanger manufacturer. Inta’s brand new Zilmet trampoline banned for being ‘too bouncy’! [Hixon-based] Heating and plumbing product manufacturer Inta has created a revolutionary trampoline using the cutting-edge ZILAN membrane usually used in its pressure vessels - and it’s thought to be one of the bounciest trampolines ever made. ZILAN, a patented compound used in Inta’s Zilmet product, is a unique membrane that promises to increase the longevity of vessels, with reduced permeability and specialised sizing. Using this innovative component, the manufacturer has developed its first ever state-of-the-art Zilmet trampoline. However, the product is not expected to go on sale anytime soon, after regulatory bodies deemed the trampoline ‘too bouncy’ for the consumer market! “Our ZILAN compound has been a game-changer in the pressure vessel market; there’s nothing else like it - it is so strong,” explained Stuart Gizzi, Director of Inta. The Zilmet trampoline has been designed to withstand a whopping 360kg - that’s almost twice the standard weight of a large trampoline. Developers have also recorded bounce heights of 30 ft - almost eight feet higher than than the official world record! Product inspector Dr Tigger Flyte said: “I tried this product in our laboratory and banged my head. Whilst we appreciate that this is an outdoor product, we are unable to give it a safety certificate until Inta significantly tones it down." Inta is currently revising the product to reduce bounce in the hope of making its Zilmet trampoline available in time for the summer months. International expansion vessel manufacturer Zilmet continues to take the lead in innovation, with the launch of its newly-developed, patented ZILAN membranes. After years of research and development, the manufacturer has unveiled its ultimate ‘second skin’ - a unique membrane that promises to increase the already impressive longevity of its products, with reduced permeability and specialised sizing. The ZILAN membranes now feature across the entire Zilmet vessel offering, further cementing the manufacturer’s position as the go-to for quality, long-lasting solutions. Unlike many others in the industry, Zilmet’s membranes veer away from the ‘one size fits all’ approach and are tailored to meet various sizes, further increasing the vessel performance. Stuart Gizzi, director at Zilmet UK, said: “Zilmet has been supplying vessels internationally for over a quarter of a decade and has earned its status as the leading brand in our field. “Despite this success and considerable growth in the UK, we always strive to improve and innovate. The new ZILAN membranes are the perfect example of this - we’ve developed a patented formula that gives our product range yet another point of difference. Leading international expansion vessel manufacturer Zilmet has been awarded CarbonNeutral certification for its UK operation. Certification is granted to businesses or organisations that have reduced their carbon emissions to net zero in accordance with The CarbonNeutral Protocol. Zilmet UK strengthened its eco credentials through a range of workplace schemes and measures. Its staff have contributed to the cause by taking up car sharing and four members have even joined the ‘Bike2Work’ scheme in a bid to completely cut their commuting carbon emissions. Zilmet’s external sales force has also been challenged to find the ‘greenest’ routes when visiting clients. Dedication has been shown at the firm’s Hixon headquarters too, with staff recycling everything but food waste, reducing print output and turning off computer monitors at lunchtime. Stuart Gizzi, director at Zilmet UK, said: “The smallest changes make the biggest difference so we’re closely monitoring and trying to reduce our carbon footprint in any way we can. Zilmet has also pledged a contribution to The Carbon Neutral Company’s Pangelengan Geothermal Project, an initiative that utilises natural geothermal resources to provide reliable and renewable electricity to 13 villages in the Pangelengan district of Indonesia. Inta and Zilmet are demonstrating a commitment to the next generation of plumbers and installers by offering to supply colleges and training facilities in the UK with a trio of their best-selling products. The companies, which share headquarters in Hixon, Staffordshire, are calling on training providers to get in touch in a bid to ensure newcomers to the trade are taught using high-quality and reliable products. 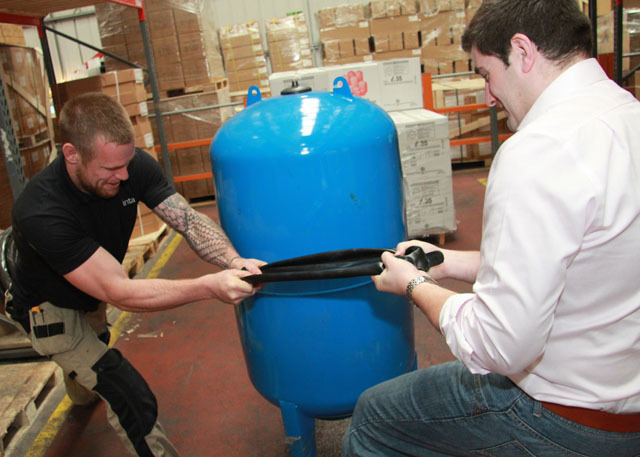 The training packs, which are valued at around £200 each, feature Zilmet’s internationally renowned expansion vessel with a sizing calculator and Inta’s bestselling Intamix and a 15mm pressure reducing valve. Also included are enough copies of its famed ‘Everything you need to know about anti-scald’ booklet for an entire cohort. Cynthia Fisher, director at Inta, said: “We know the quality of training here in the UK is fantastic, but tightened budgets mean many trainees are learning the tricks of the trade on equipment that simply isn’t held in high esteem within the industry. “It’s important that the next generation of plumbers and installers are able to recognise quality products, in order to provide the best - and most reliable - service for their customers. Building up a business and loyal customer base is difficult and the use of trustworthy products is essential in delivering a top-notch service.